You’re probably sick and tired of hearing about American pets being fat. But know this: Being overweight is the most common health threat to dogs and cats, and it’s a medical concern of epidemic proportions. A recent survey revealed that 53% of dogs and 58% of cats are overweight. And yet 90–95% of people believe their pets are at normal weights. A survey shows that only 17% of people consider their pets overweight, while 47% of veterinarians see these patients as overweight or obese. The fat gap makes discussing the problem difficult at best. Denial leads many people to be shocked when their vet tells them that their picture-perfect pet is actually overweight. My husband doesn’t listen to me about how much to feed. My wife spoils the (bleep) out of her. The dog just lies around all day — of course he’s fat! But she doesn’t eat that much. So what? I mean, he’s just a dog. From anger to denial, embarrassment to detachment, it seems Americans need a 12-step program to deal with obesity in their dogs and cats. 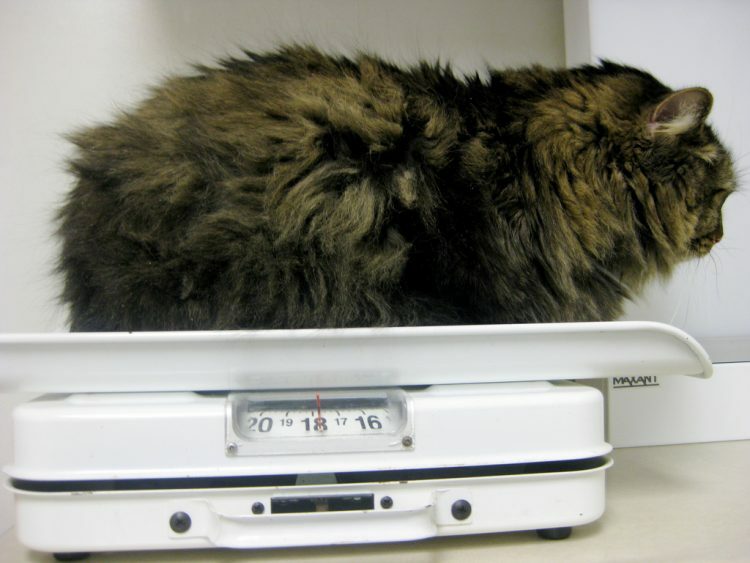 So, our job as vets is not just telling clients about their pets’ weight and the consequences — but also convincing them that their 15-pound cat, Mr. Puff-N-Stuff, is not at a normal weight. Or that a normal Beagle does not weigh 50 pounds. 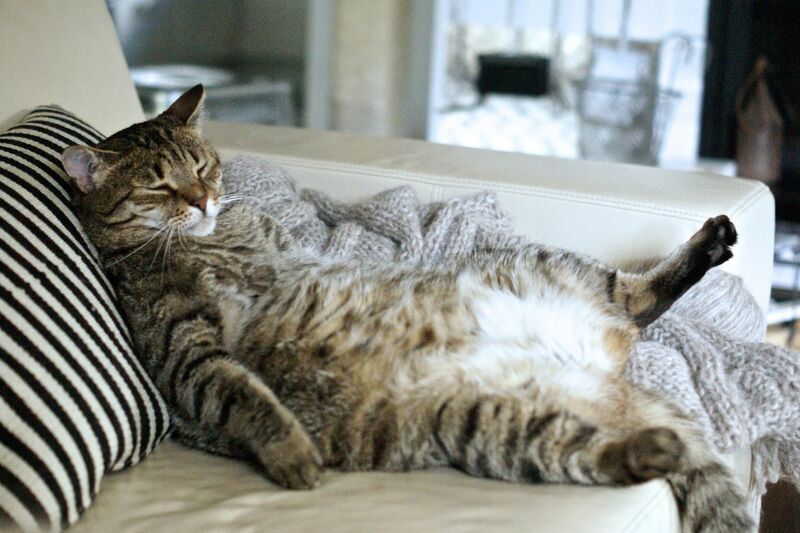 Our pets are overweight and, yes, lots of us are, too. In fact, about 72% of American adults are overweight or obese. That means, in a vet’s typical day, we are ethically charged with addressing obesity in more than half of our wellness exams. But 9 out of 10 of these clients don’t believe us, and maybe two-thirds of those people are overweight themselves. So we try to take it slow and get a feel for how the person identifies with food, not only for themselves but also for their pet. No insults, but calm truth. Being overweight affects quality of life in many ways. In addition, it can affect quantity of life — that is, lifespan. A classic study showed that thin dogs outlive chubby dogs by an average of 2 years. As you can see, looking at overweight and obesity in dogs and cats as a cosmetic problem is a serious misconception. There are serious life-threatening consequences. BCS stands for body condition score, 1 being starvation and 10 being morbidly obese. A lifetime study of Labrador Retrievers found that dogs with an ideal BCS lived about 2 years longer than their overweight counterparts. The slimmer dogs also had delayed onset of chronic disease. With these facts in focus, you need to remember that ideal weight means a better and longer life. No doubt about it. Again looking at Labs, we find that leaner dogs had delayed onset of arthritis and less pain and lameness than heavier dogs. Even a 6–8% loss of body fat improved mobility and lessened lameness problems. Intervertebral disc disease (IVDD) is a sad condition that, in the worst case, can paralyze a dog. Any dog can suffer from disc disease, but long-backed breeds — the miniature Dachshund is the poster pup for IVDD — are particularly susceptible. If your Doxie or Corgi is even moderately overweight, the risk for a disc problem is greater. And if your dog suffers from a severe disc extrusion and undergoes surgery to correct it, dogs with a healthier weight make a faster recovery. Subclinical conditions? What does that mean? Basically, overweight dogs, like people, are more prone to inflammation in the body, high cholesterol and high lipids — all of which can lead to pancreatitis, diabetes, gastrointestinal disease, etc. These problems can be brewing for years. Getting weight off an obese dog can ward off chronic, often difficult to diagnose, conditions. Obese dogs can have more trouble breathing or worsen a pre-existing condition like collapsing trachea or laryngeal paralysis. Some of you might remember the COPD commercial with the elephant sitting on the person’s chest. This is how excess weight can make our dogs feel. Obesity can also make the heart work harder. Take-home message? Keeping excess weight off your dog makes for a better life. And fewer vet visits! Isn’t it more fun for you to go for a jog with your dog than bring them in for breathing or arthritic problems? Oddly enough, obesity actually adds to more overt disease in cats than in dogs. 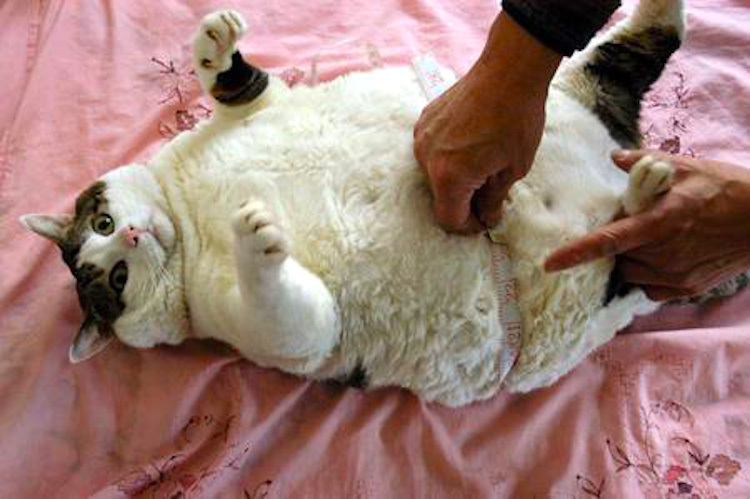 Obese cats are far more prone to diabetes, an expensive and worrisome condition to treat. Urinary problems in cats can be a nightmare for caretakers. And the kitties aren’t too happy either. Maintaining a good weight in your feline friend lowers the risk of lower urinary tract disease. Cats who live life at a normal weight are more active, have less stress and live a more enriched life. Less stress, we believe, means fewer urinary tract problems. Similar to dogs, obese cats suffer from more arthritic pain than normal-weight cats. And they are putting excess stress on every joint every time they jump down from the food bowl. The brief answer is wet food instead of dry, portion control and more exercise. Cats can hide subclinical disease very well. Pancreatitis, GI disease and even early diabetes can go unnoticed for a while. Get your cat back to a healthy weight before these conditions of obesity set in. Remember, most pets can’t use a can opener or open the refrigerator door by themselves. In this case, we are the keepers of the pantry. We are to blame for putting our pets at risk from obesity. Is obesity in your pet caused by guilt that you don’t spend enough time together? Fear that your dog won’t love you if you stop giving them treats? Or are we anthropomorphizing them into eating too much — like we do? The thing is, feeding your pets nourishes them, but it also nourishes you. Americans have such a strong human–animal bond, and feeding that pet signifies much more than a daily calorie count. Preparing a meal or offering snacks to your pet translates as love for many people. Simply put: We treat our pets like family. But we’ve taken things too far. Veterinary nutritional counseling is a specialty now. But now that we know more about correct nutrition, why are we still killing our pets with too much food? Americans have been taught to super-size their meals, and they are now doing that for their pets. 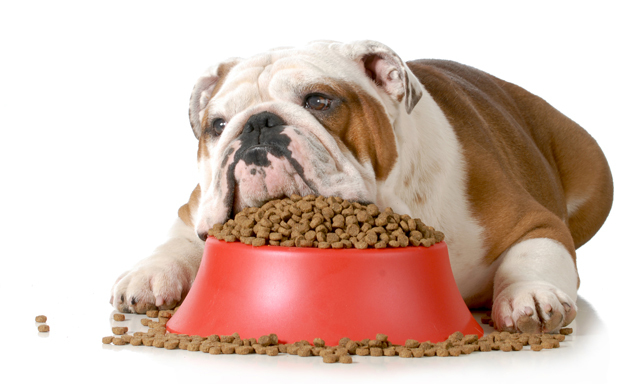 So is the junk food phenomenon that’s hurting human health now affecting how we feed our pets? We think so, and we tell our clients about it. They seem to listen to us. Some smile, go home and do whatever they want, but we have some decent results with many of our overweight pets. And the really dedicated clients see amazing results: One person rescued a 26-pound Chihuahua who now weighs 14 pounds, his ideal weight. Losing half a dog’s body weight is no easy task, but it can be done. “What you want to aim for is a gradual weight loss, perhaps 1–2% loss of body weight per week,” she says. Start by bringing your dog or cat to the vet for a weigh-in. From there, you can discuss options for weight loss and get recommendations on what type of food would fit your pet’s lifestyle best. The vet will take into account the breed, age and activity level. Dr. Elizabeth Hodgkins, DVM, author of Your Cat: Simple New Secrets to a Longer, Stronger Life, recommends wet food rather than dry for cats. But perhaps more important, she says, is putting the kibosh on an all-you-can-eat buffet. Changing this behavior is the first step in helping a cat lose weight and be healthy. 3. Make your pet work at it. Dr. Pippa Elliott, BVMS, MRCVS, suggests making mealtimes an interactive activity. “Ditch the food bowls and use puzzle feeders so the cat or dog has ‘nothing in life is free’ when it comes to food,” Dr. Elliott said, adding that dry food works well in these circumstances. This one seems relatively simple: We’re feeding our pets more than they need. Instead of just dumping food into the bowl, get into the practice of reading labels to see what the recommended servings are. Then use a measuring cup so that you can be on point with portions. Eat well, eat healthy, and move yourself and your pets. And the hardest lesson for some of us? Love need not always be given as a form of food. In other words, a way to a dog or cat’s healthy heart is decidedly not through their stomach. We love our pets and want them with us forever. While forever isn’t possible, we can certainly do everything in our power to have them around for a long time. If you are concerned that your pet may be overweight, talk with your vet. This article on obesity in dogs and cats was written by veterinarians, Dr. Debora Lichtenberg, VMD, and Dr. Phil Zeltzman, DVM, DACVS, CVJ. Chris Longenecker, a certified veterinary technician, contributed. This article was reviewed for accuracy by Dr. Pippa Elliott, BVMS, MRCVS, and was last updated Dec. 17, 2018.